Rita Pacheco teaches landscape painting March 11. Artist Rita Pacheco will lead a special landscape painting workshop at Top of the World school and park from 9 a.m. to 3 p.m. Saturday, March 11. LOCA Arts Education and Laguna Plein Air Painters Association sponsor the workshop for adult oil painters of all levels. 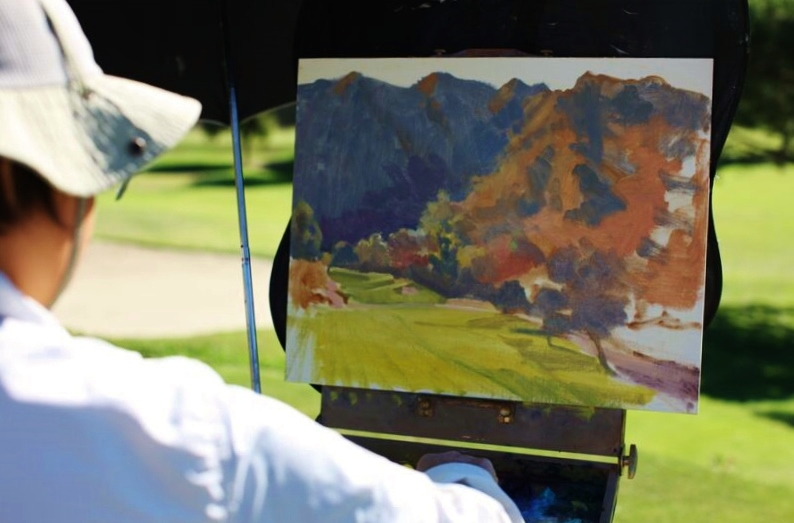 Pacheco will describe steps in the plein air process, including easel setup, planning and blocking the composition, mixing paints, and detailing the finished landscape. The cost is $135 and advance registration is required. Visit LOCAarts.org, the events and member workshops page or call 949 376-3635. The exhibit “Stream of Consciousness” at Sandstone Gallery Laguna will feature artist Jong Ro’s abstract expressionist paintings and “Moods of Nature,” mixed media painting by Lynn Welker. The show is at 384 A N Coast Highway will be on until April 3. Los Angeles-based artist Douglas Turner has installed the temporary sculpture “Nine Billion” inside the red phone booth on Forest Avenue, says the city’s manager’s weekly update. The installation references the projected world population growth to be 9 billion by 2050. The installation will be on display until 2019. In addition to the installation, the red phone booth has been restored and painted. Rita is a great instructor!